Scows Sighted: there's a 27ft replica scow sloop, La Tortuga, at the Texas State Maritime Museum in Rockport, TX. One of the few large scows to be seen in the USA. Apparently now drydocked and rotting, though. Another, restored and sailing: Alma is located on San Francisco Bay. 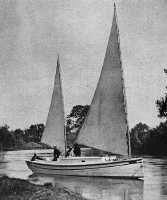 • Forest & Stream Skiff (1890) - 8ft - link to free plans. photo from the Chesapeake Bay Maritime Museum. • Just a nice sharpie photo from about 1868. "Nettie," the Gov't Survey's Boat, on the Truckee River. My favorite sharpie picture. I can locate from F&S, dating to 1874. • Rudder... 12ft, arc shaped hull made from 4-ft radius ribs. • Cheap Catamaran (1878)... a sixteen-footer. • A New Jersey Sailing Garvey... another at 16ft. Deja, a goofy ballasted 12-foot cutter. • From elsewhere: ten-foot Tahitian outrigger.